Modern wind turbines fall into two basic groups: the horizontal-axis variety, like the traditional farm windmills used for pumping water, and the vertical-axis design, like the eggbeater-style Darrieus model, named after its French inventor. 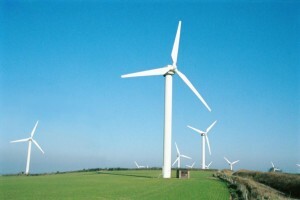 Most large modern wind turbines are horizontal-axis turbines. Horizontal-axis wind turbines (HAWT) have the main rotor shaft and electrical generator at the top of a tower, and must be pointed into the wind. 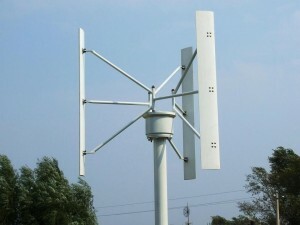 Small turbines are pointed by a simple wind vane, while large turbines generally use a wind sensor coupled with a servo motor. Most have a gearbox, which turns the slow rotation of the blades into a quicker rotation that is more suitable to drive a generator. Since a tower produces turbulence behind it, the turbine is usually pointed upwind of the tower. Turbine blades are made stiff to prevent the blades from being pushed into the tower by high winds. Additionally, the blades are placed a considerable distance in front of the tower and are sometimes tilted up a small amount. Downwind machines have been built, despite the problem of turbulence, because they don’t need an additional mechanism for keeping them in line with the wind, and because in high winds, the blades can be allowed to bend which reduces their swept area and thus their wind resistance. Since turbulence leads to fatigue failures, and reliability is so important, most HAWTs are upwind machines. These squat structures, typically (at-least) four-bladed, usually with wooden shutters or fabric sails, were developed in Europe. These windmills were pointed into the wind manually or via a tail-fan and were typically used to grind grain. In the Netherlands they were also used to pump water from low-lying land, and were instrumental in keeping its polders dry. The Eclipse windmill factory was set up around 1866 in Beloit, Wisconsin and soon became a huge success building mills for farm water pumping and railroad tank filling. Other firms like Star, Dempster, and Aeromotor also entered the market. Hundreds of thousands of these mills were produced before rural electrification and small numbers continue to be made. They typically had many blades, operated at tip speed ratios (defined below) not better than one, and had good starting torque. Some had small direct-current generators used to charge storage batteries, to provide a few lights, or to operate a radio receiver. The American rural electrification connected many farms to centrally-generated power and replaced individual windmills as a primary source of farm power by the 1950s. They were also produced in other countries like South Africa and Australia (where an American design was copied in 1876). Such devices are still used in locations where it is too costly to bring in commercial power. Water pumping rural windmill in Germany. In Schiedam, the Netherlands, a traditional style windmill (the Noletmolen) was built in 2005 to generate electricity.The mill is one of the tallest Tower mills in the world, being some 42.5 metres (139 ft) tall. Turbines used in wind farms for commercial production of electric power are usually three-bladed and pointed into the wind by computer-controlled motors. This type is produced by Danish and other manufacturers. These have high tip speeds of up to six times the wind speed, high efficiency, and low torque ripple which contributes to good reliability. The blades are usually colored light gray to blend in with the clouds and range in length from 20 to 40 metres (65 to 130 ft) or more. The tubular steel towers range from about 200 to 300 feet (60 to 90 metres) high. The blades rotate at 10-22 revolutions per minute. A gear box is commonly used to step up the speed of the generator, though there are also designs that use direct drive of an annular generator. Some models operate at constant speed, but more energy can be collected by variable-speed turbines which use a solid-state power converter to interface to the transmission system. All turbines are equipped with high wind shut down features to avoid over speed damage. • Blades are to the side of the turbine’s center of gravity, helping stability. • Ability to feather the rotor blades in a storm, to minimize damage. • Their height can create local opposition based on impacts to viewsheds. With a vertical axis, the generator and gearbox can be placed near the ground, so the tower doesn’t need to support it, and it is more accessible for maintenance. Drawbacks are that some designs produce pulsating torque. Drag may be created when the blade rotates into the wind. It is difficult to mount vertical-axis turbines on towers, meaning they are often installed nearer to the base on which they rest, such as the ground or a building rooftop. The wind speed is generally slower at a lower altitude, so less wind energy is available for a given size turbine. Air flow near the ground and other objects can create turbulent flow, which can introduce issues of vibration, including noise and bearing wear which may increase the maintenance or shorten the service life. However, when a turbine is mounted on a rooftop, the building generally redirects wind over the roof and this often doubles the wind speed at the turbine. If the height of the rooftop mounted turbine tower is approximately 50% of the building height, this is near the optimum for maximum wind energy and minimum wind turbulence. • As the rotor blades are vertical, a yaw device is not needed, reducing cost. • VAWTs have a higher airfoil pitch angle, giving improved aerodynamics while decreasing drag at low and high pressures. • Straight bladed VAWT designs with a square or rectangular crossection have a larger swept area for a given diameter than the circular swept area of HAWTs. • Mesas, hilltops, ridgelines and passes can have faster winds near the ground because the wind is forced up a slope or funnelled into a pass and into the path of VAWTs situated close to the ground. • Low height useful where laws do not permit structures to be placed high. • Does not need a free standing tower so is much less expensive and stronger in high winds that are close to the ground. • Usually have a lower Tip-Speed ratio so less likely to break in high winds. • They can potentially be built to a far larger size than HAWT’s , for instance floating VAWT’s hundreds of meters in diameter where the entire vessel rotates , can eliminate the need for a large and expensive bearing. • There may be a height limitation to how tall a vertical wind turbine can be built and how much sweep area it can have. However, this can be overcome by connecting a multiple number of turbines together in a triangular pattern with bracing across the top of the structure . Thus reducing the need for such strong vertical support, and allowing the turbine blades to be made much longer. • Most VAWTs produce energy at only 50% of the efficiency of HAWTs in large part because of the additional drag that they have as their blades rotate into the wind. This can be overcome by using structures to funnel more and align the wind into the rotor (e.g. “stators” on early Windstar turbines) or the “vortex” effect of placing straight bladed VAWTs closely together (e.g. Patent # 6784566). • Most VAWTS need to be installed on a relatively flat piece of land and some sites could be too steep for them but are still usable by HAWTs. • Most VAWTs have low starting torque, and may require energy to start the turning. • A VAWT that uses guy wires to hold it in place puts stress on the bottom bearing as all the weight of the rotor is on the bearing. Guy wires attached to the top bearing increase downward thrust in wind gusts. Solving this problem requires a superstructure to hold a top bearing in place to eliminate the downward thrusts of gust events in guy wired models. • While VAWTs’ parts are located on the ground, they are also located under the weight of the structure above it, which can make changing out parts near impossible without dismantling the structure if not designed properly.